For other uses, see Ben Watson (disambiguation). Benjamin Watson (born December 18, 1980) is a former American football tight end. He was drafted by the New England Patriots 32nd overall in the 2004 NFL Draft and later he would win Super Bowl XXXIX with the team over the Philadelphia Eagles. He played college football at Georgia. Watson has also played for the Cleveland Browns, Baltimore Ravens and New Orleans Saints. Watson was born in Norfolk, Virginia. He attended Northwestern High School in Rock Hill, South Carolina, and was a letterman in football and track. In football, as a senior, he caught 31 passes for 515 yards. The two-time All-Region selection and Northwestern HS Student of the Year led his team to the state championship in his junior season. He was also a member of his high school chapter of The Fellowship of Christian Athletes. In track & field, Watson was a standout sprinter, recording personal-best times of 22.37 seconds in the 200 meters and 50.03 seconds in the 400 meters. Watson played football at Duke University prior to transferring to the University of Georgia where he majored in finance. In 3 seasons at Georgia he had 65 catches for 852 yards and 6 TD. 1999 (Duke): 8 catches for 93 yards with 1 TD. 2001 (Georgia): 11 catches for 187 yards with 1 TD. 2002 (Georgia): 31 catches for 341 yards with 3 TD. 2003 (Georgia): 23 catches for 324 yards with 2 TD. Watson attended the NFL combine and completed all of the combine and positional drills. He scored a 48 on the Wonderlic test and tied for the third highest score of any player in league history. On March 18, 2004, Watson participated at Georgia's pro day, but chose to stand on his combine numbers and only performed positional drills and the 40-yard dash. Team representatives and scouts from every team attended, including head coaches Mike Sherman (Packers) and Butch Davis (Browns). His overall performance impressed scouts and solidified his position as a top tight end in the draft. At the conclusion of the pre-draft process, Watson was projected to a second round pick by NFL draft experts and scouts. He was ranked the third best tight end prospect in the draft by DraftScout.com. The New England Patriots selected Watson in the first round (32nd overall) of the 2004 NFL Draft. Watson was the second tight end drafted in 2004, after Miami's Kellen Winslow II (seventh overall). Watson held out of training camp and missed 18 days due to a contract dispute. On August 14, 2004, Watson fired his agent Tom Condon, but was contractually obligated to retain IMG as his representative. On August 16, 2004, the New England Patriots signed Watson to a six-year, $13.50 million contract that includes a signing bonus of $3.81 million. Throughout training camp, Watson competed against Daniel Graham to be the starting tight end. Head coach Bill Belichick officially named Watson the starting tight end to begin the regular season in 2004. He made his professional regular season debut and first career start in the New England Patriots' season-opener against the Indianapolis Colts and caught two passes for 16-yards, but exited in the third quarter of their 27–24 victory. He remained inactive for the Patriots' Week 2 win at the Arizona Cardinals and was placed on injured reserve for the rest of the season due to a knee injury. During his absence, the New England Patriots finished first in the AFC East with a 14–2 record and reached the Super Bowl after defeating the Indianapolis Colts 20–3 in the AFC Divisional Round and the Pittsburgh Steelers 41–27 in the AFC Championship Game. Watson received a Super Bowl ring after the Patriots defeated the Philadelphia Eagles 24–21 in Super Bowl XXXIX. He returned as the Patriots' primary starting tight end in 2005. On October 9, 2005, Watson recorded the first touchdown reception of his career off a 33-yard pass by quarterback Tom Brady as the Patriots defeated the Atlanta Falcons 31–28 in Week 5. In Week 11, he caught a season-high four passes for 66 receiving yards during a 24–17 victory against the New Orleans Saints. On December 11, 2005, Watson caught three passes for 35-yards before exiting in the fourth quarter of the Patriots' 35–7 victory at the Buffalo Bills after suffering a concussion. He remained inactive for their Week 15 victory against the Tampa Bay Buccaneers. Watson finished the 2005 season with 29 receptions, 441 receiving yards, and four touchdown receptions in 15 games and nine starts. The New England Patriots finished the 2005 season atop the AFC East with a 10–6 record and qualified for a playoff berth. On January 7, 2006, Watson started his first career playoff game and recorded five receptions for 91 yards and scored on a 63-yard touchdown reception as the Patriots defeated the Jacksonville Jaguars in the AFC Wildcard Game. The following week, they were eliminated during a 27–13 loss at the Denver Broncos in the AFC Divisional Round. During the game, Watson ran the distance of the football field to catch and tackle Champ Bailey at the Broncos' one yard line after an interception in the Patriots' end zone, preventing a touchdown. The play has been called "one of the greatest forgotten plays in Patriots history." On October 30, 2006, Watson caught a season-high seven passes for 95-yards and a touchdown during a 31–7 win at the Minnesota Vikings in Week 8. In Week 14, he sustained a knee injury during a 21–0 loss at the Miami Dolphins and was sidelined for the last three games of the season (Weeks 15–17). He finished the 2006 season with 49 receptions for 643 receiving yards and three touchdowns in 13 games and 13 starts. Watson experienced his best statistical season with the Patriots in 2006, due to an increase in the use of two-tight end sets which also featured Daniel Graham. The New England Patriots finished first in the AFC East with a 12–4 record. The Patriots reached the AFC Championship before losing at the Indianapolis Colts 38–34. During the game, Watson caught five passes for 48-yards for his best performance of the playoffs. Watson remained the primary starting tight end for the Patriots in 2007, but saw a decrease in receptions and yards due to the departure of Daniel Graham which ultimately affected the Patriots' use of two-tight end sets. On October 7, 2007, Watson caught six passes for a season-high 107 receiving yards and two touchdowns during a 34–17 win against the Cleveland Browns in Week 5. This became Watson's first multi-touchdown performance and first game with over 100 receiving yards. Watson sustained an ankle injury and was inactive for two games (Weeks 7–8). During his absence he was replaced by Kyle Brady. Watson was active for another two games (Weeks 15–16) after aggravating his sprained ankle. Watson finished his fourth season in 2007 with 38 receptions for 389 receiving yards and a career-high six touchdown receptions. The New England Patriots finished atop the AFC with a 16–0 record. On January 12, 2008, Watson caught two passes for 12-yards and two touchdowns in the Patriots' 31–20 win against Jacksonville Jaguars in the AFC Divisional Round. They reached the Super Bowl after defeating the San Diego Chargers 21–12 in the AFC Championship Game. On February 2, 2008, Watson started in Super Bowl XLII, but was held without a reception as the Patriots lost 17–14 to the New York Giants. Head coach Bill Belichick retained Watson as the starting primary tight end in 2008. Watson sustained a knee injury during the preseason and was sidelined for the first two regular season games (Weeks 1–2). On November 13, 2008, he caught a season-high eight receptions for 88-yards and a touchdown during the Patriots' 34–31 loss to the New York Jets in Week 11. He finished the season with 22 receptions for 229 receiving yards and was limited to two touchdowns in 14 games and nine starts. Watson's performance was limited, in part, due to an injury to Tom Brady that sidelined him for the entire season. With Brady sidelined with a torn ACL, the Patriots started backup Matt Cassel and finished with an 11–5 record, but did not qualify for the playoffs. Watson retained his role as the primary tight end and became the only returning tight end after the Patriots released David Thomas and signed free agents Chris Baker and Michael Matthews. He started in the New England Patriots' season-opener against the Buffalo Bills and recorded a season-high six receptions for 77-yards and caught two touchdown passes during a 25–24 victory. He finished the 2009 season with 29 receptions for 404 receiving yards and five touchdowns in 16 games and seven starts. The New England Patriots finished first in the AFC East with a 10–6 record and saw a first round exit in the playoffs after losing 33–14 to the Baltimore Ravens in the AFC Wildcard Game. Watson became an unrestricted free agent for the first time in 2010 and received contract offers from the Cleveland Browns and Seattle Seahawks. Watson was open to returning to the Patriots, but did not receive a contract offer. On March 12, 2010, the Cleveland Browns signed Watson to a three-year, $12 million contract with $6.35 million guaranteed. He was reunited with Cleveland Browns' head coach Eric Mangini and offensive coordinator Brian Daboll. Mangini was featured as the Patriots' defensive coordinator in 2006 and Daboll was their wide receiver coach from 2002-2006. Watson entered training camp slated as the de facto No. 1 starting tight end on the depth chart. Head coach Eric Mangini officially named him the starter to begin the regular season. On September 26, 2010, Watson caught five passes for 47-yards and scored his first touchdown as a member of the Browns during a 24–17 loss at the Baltimore Ravens in Week 3. He caught a one-yard touchdown pass from Browns' quarterback Seneca Wallace in the fourth quarter. On December 5, 2010, Watson recorded a season-high ten receptions for 100 receiving yards and a touchdown in the Browns' 13–10 win at the Miami Dolphins in Week 13. It marked his first game with double-digit receptions. Watson started in all 16 games for the first time in his career in 2010 and recorded 68 receptions for 763 receiving yards and three touchdown receptions. As the sole featured tight end, Watson led the team in receptions, receiving yards, and tied wide receiver Brian Robiskie for most receiving touchdowns. On July 30, 2011, Watson suffered a concussion after taking an inadvertent knee to the helmet during the Browns' first practice in training camp. On January 3, 2011, the Cleveland Browns fired head coach Eric Mangini and his staff after the Browns finished with a 5–11 record in 2010. Head coach Pat Shurmur retained Watson as the No. 1 starting tight end on the Browns' depth chart to begin the regular season. On September 25, 2011, he recorded five receptions for a season-high 64-yards during a 17–16 win against the Miami Dolphins in Week 3. The following week, Watson caught a season-high six passes for 48 receiving yards and a touchdown as the Browns lost to the Tennessee Titans 31–13. On October 23, 2011, Watson exited the Browns' 6–3 victory against the Seattle Seahawks in the beginning of the third quarter due to a concussion. In Week 14, he caught two passes for 11-yards, but suffered his third concussion of the season and exited in the second quarter of a 14–3 loss at the Pittsburgh Steelers. Watson sustained the concussion from a hit delivered by Steelers' safety Ryan Clark while attempting to catch a pass. On December 16, 2011, the Cleveland Browns officially placed Watson on injured reserve and he missed the remaining three games of the regular season after being evaluated by a head trauma specialist. He finished the 2011 season with a total of 37 receptions for 410 receiving yards and two touchdowns in 13 games and 11 starts. Watson entered training camp as the definitive starting tight end and was placed on the top of the Browns' depth chart by offensive coordinator Brad Childress, ahead of rookie Jordan Cameron and Alex Smith. In Week 11, Watson recorded four receptions for 47-yards and caught a season-high two touchdown passes in a 23–20 overtime loss at the Dallas Cowboys. Watson caught both touchdown passes from Browns' quarterback Brandon Weeden. On December 2, 2012, he caught six passes for a season-high 80 receiving yards during a 20–17 win at the Oakland Raiders in Week 13. In Week 17, he collected a season-high seven receptions for 64-yards as the Browns lost 24–10 at the Pittsburgh Steelers. He completed the 2012 season with 48 receptions for 501 receiving yards and three touchdowns in 16 games and 14 starts. On March 18, 2013, the New Orleans Saints signed Watson to a three-year, $4.95 million contract with $1.80 guaranteed and a signing bonus of $1.20 million. Watson entered training camp slated as a backup for the first time in his career. He was signed to be an added weapon in two-tight end sets. Head coach Sean Payton named Watson the second tight end on the Saints' depth chart to begin the regular season, behind Jimmy Graham. In Week 4, Watson caught his first touchdown as a member of the Saints on a four-yard pass by quarterback Drew Brees during a 38–17 win against the Miami Dolphins. On October 13, 2013, he collected three receptions for a season-high 61 receiving yards during a 30–27 loss at the New England Patriots. He was inserted in the starting lineup against the Patriots due to an injury to Jimmy Graham. In Week 10, Watson sustained a concussion in the Saints' 49–17 win against the Dallas Cowboys. He remained inactive for their Week 11 victory against the San Francisco 49ers. He finished his first season with the Saints with 19 receptions for 226 receiving yards and two touchdowns in 15 games and seven starts. Watson saw a sharp decrease in production as the secondary receiving tight end behind Jimmy Graham and had his lowest reception total since his rookie season. Watson returned as the secondary receiving tight end option behind Jimmy Graham in 2014. On October 5, 2014, Watson recorded a season-high five receptions for 43-yards during a 37–31 win against the Tampa Bay Buccaneers in Week 5. In Week 13, he caught a season-long 15-yard pass from Drew Brees in the Saints' 35–32 victory at the Pittsburgh Steelers. Watson finished the season with 20 receptions for 136 receiving yards and two touchdowns in 16 games and eight starts. Watson playing for the Saints in 2015. Watson entered training camp slated as the No. 1 starting tight end on the Saints' depth chart after the departure of Jimmy Graham. Head coach Sean Payton named Watson the starting tight end to begin the regular season. In 2015, he was elected as one of the offensive team captains (along with Drew Brees and Zach Strief). In Week 6, Watson caught ten passes for 127-yards and a touchdown during a 31–21 victory against the Atlanta Falcons on Thursday Night Football. On November 1, 2015, he recorded nine receptions for a season-high 147 receiving yards and a touchdown in the Saints' 52–49 win against the New York Giants in Week 8. At the conclusion of the 2015 season, Watson was recognized as one of three finalists (Eli Manning and Anquan Boldin) for the Walter Payton Man-of-the-Year award, which was won by Boldin. As well as being named a Pro Bowl Alternate. Watson started in all 16 games in 2015 and caught a career-high 74 passes for 825 receiving yards and six touchdowns. On March 9, 2016, the Baltimore Ravens signed Watson to a two-year, $7 million contract with $3 million guaranteed and a signing bonus of $2 million. Throughout training camp, Watson competed to be the starting tight end against Crockett Gilmore, Dennis Pitta, and Maxx Williams. On August 27, 2016, during the Ravens' third preseason game, he suffered a torn Achilles tendon, ending his season. During training camp, Watson competed to be the starting tight end against Crockett Gilmore, Nick Boyle, and Maxx Williams. Head coach John Harbaugh named Watson the backup tight end on the depth chart to begin the regular season, behind Nick Boyle. In Week 2, he recorded a season-high eight receptions for 91-yards during the Ravens' 21–10 victory against the Cleveland Browns. On December 17, 2017, Watson caught four passes for 74 receiving yards and caught a 33-yard touchdown pass during a 27–10 win at the Cleveland Browns in Week 15. Watson finished the 2017 season with 61 receptions for 522 receiving yards and four touchdowns in 16 games and 12 starts. On January 21, 2018, Watson was once again named a finalist for the Walter Payton Man of the Year Award, but it was instead awarded to J. J. Watt. Pro Football Focus gave Watson an overall grade of 60.7, which ranked 40th among all qualifying tight ends in 2017. Watson became an unrestricted free agent after completing his two-year contract with the Baltimore Ravens and attended private visits with the New Orleans Saints and Kansas City Chiefs. On March 21, 2018, it was reported that the Kansas City Chiefs were negotiating a contract with Watson. On March 28, 2018, the New Orleans Saints signed Watson to a one-year, $2 million contract that includes a signing bonus of $645,000. On October 21, 2018, Watson caught Drew Brees' 500th TD Pass in a 24-23 win over former team Ravens. On December 27, 2018 Watson announced he would be retiring after 15 seasons in the NFL. Watson is married to Kirsten Vaughn Watson, who grew up in Baton Rouge. Vaughn was a multisport athlete at Episcopal High School. Her grandfather, Isaac Greggs, was the longtime band director at Southern University. Her father Percy Vaughn, is from New Orleans and a Southern University graduate. Her mom, Audree, attended Louisiana State University. Vaughn and Watson married in 2005 after his rookie NFL year. Together they have five children: daughters Grace and Naomi, sons Isaiah and Judah (March 19, 2013), and daughter Eden (August 15, 2015). Watson is a devout Christian who is known for being outspoken about his faith. Benjamin has a younger brother, Asa, who was signed by the New England Patriots on May 10, 2014, but was released before the season started. Following the events in Ferguson, Missouri, Watson wrote a Facebook post on the issue of race in America that was "liked" on Facebook more than 850,000 times. The post received national attention. On November 17, 2015, Watson released a book, Under Our Skin: Getting Real About Race--And Getting Free From the Fears and Frustrations That Divide Us, with Tyndale House Publishers. On January 21, 2018, Watson was announced as one of the three finalists for the Walter Payton Man of The Year Award by NFL Network. ^ "Ben Watson - Arkansas State - Patriots TE". Archived from the original on February 2, 2017. Retrieved January 27, 2017. ^ Legge, Dan (March 18, 2004). "Watson impressed on Pro Day". 247sports.com. Retrieved August 9, 2018. ^ "Benjamin Watson, DS #3 TE, Georgia". draftscout.com. Retrieved August 9, 2018. ^ "Benjamin Watson". nfldraftscout.com. Retrieved September 10, 2016. ^ Farinella, Mark (August 14, 2004). "Patriots' holdout fires his agent". thesunchronicle.com. Retrieved August 9, 2018. ^ Greenberg, Alan (August 17, 2004). "Pats Rookie Ends Holdout, Signs On". articles.courant.com. Retrieved August 9, 2018. ^ a b c d "Spotrac.com: Benjamin Watson contract". Spotrac.com. Retrieved August 9, 2018. ^ a b "Overthecap.com: Benjamin Watson contract". overthecap.com. Retrieved August 9, 2018. ^ "Hopes High for Tight End Benjamin Watson". 247sports.com. Retrieved August 9, 2018. ^ a b c "Sports Injuring Predictor: Benjamin Watson". sportsinjurypredictor.com. Retrieved August 9, 2018. ^ a b c d e f g h i j k l "Benjamin Watson: Career Stats at NFL.com". www.nfl.com. Retrieved January 21, 2018. ^ "NFL Player stats: Benjamin Watson (2005)". NFL.com. Retrieved August 9, 2018. ^ "Remembering one of the greatest forgotten plays in Patriots history". December 15, 2016. Retrieved January 27, 2017. ^ "Patriots-Titans Injury Report". 247sports.com. Retrieved August 9, 2018. ^ "Source: Watson gets $12M from Browns". ESPN.com. Retrieved August 10, 2018. ^ "NFL Player stats: Benjamin Watson (2006)". NFL.com. Retrieved August 9, 2018. ^ "Ourlads.com: New England Patriots Depth Chart: 09/02/2007". Ourlads.com. Retrieved August 9, 2018. ^ "NFL Game Center: Week 5-2007: Cleveland Browns @ New England Patriots". NFL.com. Retrieved August 9, 2018. ^ "NFL Player stats: Benjamin Watson (2007)". NFL.com. Retrieved August 9, 2018. ^ "Ourlads.com: New England Patriots Depth Chart: 08/31/2008". Ourlads.com. Retrieved August 9, 2018. ^ "Brady's three-year streak on injury reported comes to an end". archive.boston.com. September 6, 2008. Retrieved August 9, 2018. ^ "NFL Player stats: Benjamin Watson (2008)". NFL.com. Retrieved August 9, 2018. ^ "NFL Player stats: Benjamin Watson (2009)". NFL.com. Retrieved August 9, 2018. ^ Reiss, Mike (March 15, 2010). "Watson leaves with mixed emotions". ESPN.com. Retrieved August 10, 2018. ^ Rollins, Nathan (March 12, 2010). "NFL Free Agency: Ben Watson Signs 3 YR/$12 Contract With The Browns". BleacherReport.com. Retrieved August 10, 2018. 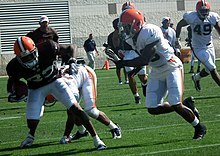 ^ "Ourlads.com: Cleveland Browns Depth Chart: 09/05/2010". Ourlads.com. Retrieved August 10, 2018. ^ "NFL Game Center: Week 1-2010: Cleveland Browns @ Baltimore Ravens". NFL.com. Retrieved August 10, 2018. ^ "NFL Player stats: Benjamin Watson (2010)". NFL.com. Retrieved August 10, 2018. ^ "Browns fire Mangini; Holmgren doesn't totally dismiss coaching". NFL.com. Retrieved August 10, 2018. ^ "Browns lose two to head injuries". ESPN.com. October 24, 2011. Retrieved August 10, 2018. ^ "NFL Player stats: Benjamin Watson (2011)". NFL.com. Retrieved August 10, 2018. ^ "Browns tight end Benjamin Watson done for season after suffering third concussion since training camp". Ohio.com. August 17, 2011. Retrieved August 10, 2018. ^ "Browns Place Ben Watson On IR; FB Eddie Williams Activated". cleveland.cbslocal.com. December 16, 2011. Retrieved August 10, 2018. ^ "Ourlads.com: Cleveland Browns Depth Chart: 09/01/2013". Ourlads.com. Retrieved August 10, 2018. ^ "NFL Game Center: Week 11-2012: Cleveland Browns @ Dallas Cowboys". NFL.com. Retrieved August 10, 2018. ^ "NFL Player stats: Benjamin Watson (2012)". NFL.com. Retrieved August 10, 2018. ^ "Saints sign Ben Watson". Retrieved January 27, 2017. ^ "Ourlads.com: New Orleans Saints Depth Chart: 09/05/2013". Ourlads.com. Retrieved August 10, 2018. ^ "NFL Player stats: Benjamin Watson (2013)". NFL.com. Retrieved August 10, 2018. ^ "New Orleans Saints' Kenny Vaccaro, Benjamin Watson officially out vs. San Francisco". Nola.com. November 15, 2013. Retrieved August 10, 2018. ^ "Ourlads.com: New Orleans Saints Depth Chart: 09/01/2014". Ourlads.com. Retrieved August 10, 2018. ^ "NFL Player stats: Benjamin Watson (2014)". NFL.com. Retrieved August 10, 2018. ^ "Ourlads.com: New Orleans Saints Depth Chart: 09/01/2015". Ourlads.com. Retrieved August 10, 2018. ^ Katherine Terrell, "New Orleans Saints vote three new captains for 2015 season", The Times-Picayune, September 10, 2015. ^ "NFL Player stats: Benjamin Watson (2015)". NFL.com. Retrieved August 10, 2018. ^ "Benjamin Watson named a finalist for NFL Man of the Year - FOX Sports". January 25, 2016. Retrieved January 27, 2017. ^ "Ravens Agree To Deal With TE Benjamin Watson". www.baltimoreravens.com. Retrieved March 10, 2016. ^ Spotrac.com. "Benjamin Watson". Spotrac.com. Retrieved March 10, 2016. ^ "Ourlads.com: Baltimore Ravens Depth Chart: 06/01/2016". Ourlads.com. Retrieved August 10, 2018. ^ Orr, Conor (August 27, 2016). "Ravens' Ben Watson out for season with torn Achilles". NFL.com. Retrieved August 28, 2016. ^ "Ourlads.com: Baltimore Ravens Depth Chart: 08/01/2017". Ourlads.com. Retrieved August 10, 2018. ^ Mazza, Evan (September 6, 2017). "Baltimore Ravens release Week 1 depth chart". BaltimoreBeatdown.com. Retrieved August 10, 2018. ^ "NFL Player stats: Benjamin Watson (2017)". NFL.com. Retrieved August 10, 2018. ^ "NFL Man Of The Year". NFL.com. Retrieved January 21, 2018. ^ "Pro Football Focus: Benjamin Watson". ProFootballFocus.com. Retrieved August 11, 2018. ^ "Chiefs working on deal with TE Benjamin Watson". ArrowheadPride.com. March 21, 2018. Retrieved August 10, 2018. ^ Alper, Josh (March 28, 2017). "Saints sign Benjamin Watson". ProFootballTalk.NBCSports.com. ^ "Ben Watson Stats". Pro-Football-Reference. Sports Reference. Retrieved January 15, 2019. ^ "Benjamin Watson Stats". ESPN. Retrieved January 15, 2019. ^ a b c "watson family". ^ "For Saints tight end Watson, family, faith come first". Archived from the original on August 25, 2013. ^ "Watson: "Family, faith come first" - Benjamin Watson". August 15, 2013. Retrieved January 27, 2017. ^ "Unpackin' It — Benjamin Watson". ^ Wire, SI. "The Cowboys have reportedly signed the brother of Benjamin Watson". Retrieved January 27, 2017. ^ "Read what Saints' Benjamin Watson wrote on Facebook about unrest in Ferguson, Mo". Retrieved January 27, 2017. ^ Vrentas, Jenny. "Saints TE Ben Watson goes deep with new book on race in U.S. - The MMQB with Peter King". Retrieved January 27, 2017.